Reviews are an important part of today’s decision making process. Whether you’re looking for a new checking account, or making a major decision like buying your first home or refinancing your existing one, reviews are one of the best ways that you can get feedback from others about their experience and find the right people and businesses to work with. Write a Bank Review is a simple application we’ve built to start collecting reviews from bank customers about their experiences with their bank. In less than a minute or so you’re able to leave us feedback about your experience with your bank which we will then use to help others make better banking decisions and help banks improve where they are falling short. We want to improve your banking experience. We’ve all heard about people’s dissatisfaction with major banks, but we also know that there are millions of happy bank customers who can share their experiences and help others connect with a great bank. By reviewing your bank you’re helping your peers improve their banking experience and anonymously letting your bank know how good of a job they are doing. Get started now, write a bank review! 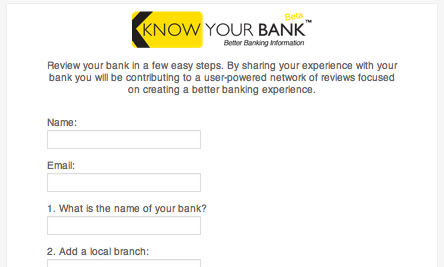 Knowyourbank.com was founded with one goal in mind, to provide knowledge for your financial decisions. We do this by creating educational content with a focus on personal finance. The information contained is for general information and does not constitute professional financial advice. Knowyourbank.com has financial relationships with some of the companies mentioned in this website. Many of the offers and links appearing on this site are from advertisers from which this website receives compensation for being listed here. This compensation may impact how and where products appear on this site (including, for example, the order in which they appear). These offers do not represent all deposit accounts or credit options available. KnowYourBank.com strives to provide transparency, as such we have provided a list of all of our advertising partners, click here.